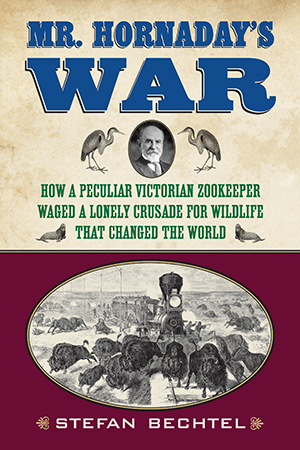 Mr. Hornaday’s War is a long-overdue bigoraphy of William Temple Hornaday, first director of the Bronx Zoo, who helped launch the American conservation movement. He was complex, quirky, pugnacious, and difficult. He seemed to create enemies wherever he went, even among his friends. A fireplug of a man who stood only five feet eight inches in his stocking feet, he began as a taxidermist and an adventurer who tracked tigers in Borneo with friendly headhunters, lead crocodile-hunting expeditions in the Orinoco, and scouted the last remaining bison in the Montana territories. William Temple Hornaday (1854-1937) was also a man ahead of his time. He was the most influential conservationist of the nineteenth century, second only to his great friend and ally Theodore Roosevelt. When this one-time big-game collector witnessed the wanton destruction of wildlife prevalent in the Victorian era, he experienced an awakening and devoted the rest of his life to protecting our planet’s endangered species. Hornaday founded the National Zoo in Washington, D.C., served for thirty years as director of the renowned Bronx Zoo, and became a fierce defender of wild animals and wild places. He devoted fifty years to fighting gun manufacturers, poachers, scandalously lax game-protection laws, and the vast apathy of the American public. He waged the “Plume Wars” against the feathered-hat industry and is credited with having saved both the Alaskan fur seal and the American bison from outright extinction. Mr. Hornaday’s War restores this major figure to his rightful place as one of the giants of the modern conservation movement. But Stefan Bechtel also explores the grinding contradictions of Hornaday’s life. Though he crusaded against the wholesale slaughter of wildlife, he was at one time a trophy hunter, and what happened in 1906 at the Bronx Zoo, when Hornaday displayed an African man in an “ethnographic exhibit,” shows a side of him that is as baffling as it is repellant. This gripping book takes an honest look at a fascinating, enigmatic man who both represented and transcended his era’s paradoxical approach to wildlife, and who profoundly changed the course of the conservation movement for generations to come. It was late September of 1886, and along the Yellowstone River outside Miles City, Montana, the shimmering aspen leaves were just beginning to turn, like cascades of tiny golden coins. Four months after his first, exploratory expedition into the territories, Hornaday had once again boarded a westbound train in Washington, but this time he was prepared for an organized, extended hunt. He also was returning with a much better feel for the lay of the land in the rugged coulee country north of the Yellowstone, and of the habits of the few remaining buffalo who remained alive there--if it was not already too late. This time, he knew almost for certain that there were at least a few animals hiding out in the headwaters of Sand Creek and the Little and Big Dry creeks, probably tucked away up in the heads of the ravines. His great hope was to secure twenty specimens and get back over the Yellowstone within two months,”before the terrors of a Montana winter should catch us afield.”1 Secretary Spencer Baird had asked that Hornaday attempt to secure that many animals because if he was successful, the skins and skeletons could be distributed to other museums, which were as bereft of decent specimens as the National Museum. This expedition was to become the last organized buffalo hunt in Montana, and one of the last in the United States. Hornaday was not unaware of the profound melancholy that hung over the whole affair, like the faint odor of something beginning to go bad. In his autobiography, written forty-eight years after these events had faded into memory, Hornaday acknowledged his own misgivings over what the museum party was about to do--and begged the forgiveness of future generations for what could arguably be called a crime. But to Hornaday’s way of thinking, he was there only to remedy the atrocities committed by a criminal enterprise--the million individual crimes of the buffalo-killing industry that grew up in the West in the mid- to late 1800s, and the “criminal indifference” of the government that allowed it to happen. On this “last buffalo hunt,” Hornaday had engaged the services of Irwin Boyd as guide, hunter, and foreman, and Boyd had hired on two veteran Montana cowboys, Jim McNaney and L.S.”Russ” Russell. McNaney was not only a crack shot and champion rider, but he also had a reputation for playing the meanest firelight mouth-organ in all of Montana. He was a former hide-hunter who claimed to have brought down 3,300 buffalo in his day, but he knew the Missouri-Yellowstone Divide as well as anybody, and if anyone could find buffalo in it, it was McNaney. For the buffalo, it was the end of days, and Hornaday could see no way forward but to shake hands with the devil. Again, the quartermaster at Fort Keogh had supplied a six-mule wagon, a Sibley tent and stove, cooking utensils, commissary stores, and even a grizzled old camp cook named McCanna,known as “Mac.” The next day, Hornaday bought two months’ supplies of commissary stores, a team, and two saddle-horses, and he hired three more horses and a set of double harness. All the cowboys came with their own horses, so that in the whole outfit, there were ten horses, a team, and two good saddle-horses for each hunter, plus a light ranch wagon that could go anywhere, the ATV of its day. The worst of it was that they had to haul 2,000 pounds of oats into buffalo country to feed all those horses, and even that probably wouldn’t last the whole trip. The soldiers of the Fifth Infantry arrived in Miles City to help pack up the wagons on the day of departure, but by mid-afternoon, they were all uproariously drunk, waving whiskey bottles overhead as the team, wagon, and horses made their way out of town. Three miles out of town, on a steep hill, the wagon tipped over and 4,000 pounds of food and supplies went clattering down the hill. McCanna and the driver, who with Hornaday were the only sober passengers, had to supervise reloading the wagon, and they were far from happy about it. By the time they got to Chapman’s ranch and set up camp that first night, the soldiers were too “shiftless and drunk” even to put up their tents, so they slept in the open. Hornaday, meanwhile, had the runs. It was an inglorious start for the last buffalo hunt. By September 29, they had reached the HV Ranch, as desolate and half-finished-looking as the LU-Bar, on Big Dry Creek, about 90 miles from Miles City. Here, they unloaded the provisions from the six-mule wagon, loaded up the wagon with bleached-white skeletons and skulls of buffalo which they’d picked up along the way, and sent the wagon back to Fort Keogh. The cowboys, with their penchant for nicknaming everything for which they felt affection, were by now calling Brown “Browney” or “Flapjack Bill” (after he was discovered secretly making himself a stack of pancakes one morning). In the following days, Hornaday, Hedley, and the cowboys scoured this difficult country, full of wild and rugged buttes, steep-sided ravines, and badlands, without finding any sign at all of buffalo. But it was the sort of country in which embattled game loved to hide, and on October 13, after almost three weeks in the field, one of the cowboys, Russ Russell, got lucky. In the late afternoon, he came across seven buffalo lying up in the shadows at the head of a deep ravine. As they stumbled to their feet and took off at a dead run, Russell got off a few shots from horseback, but he missed, and they all went thundering away. He chased them for two or three miles, but his horse was tired and the buffalo escaped, heading due south. Russell brought this great news back to the rest of the hunters at the camp on Big Dry Creek. Hornaday concluded that the cowboy’s discovery must mean the buffalo were in the habit of hiding in the shady coolness at the head of these ravines whenever they were disturbed on their favorite feeding grounds further south. The next morning at first light, Hornaday and three cowboys, mounted on fresh horses, returned to Russell’s ravine and picked up the trail of the seven buffalo. They followed the trail into the devilishly difficult country that the cowboys called “gumbo ground,” where the soil was loose and crumbly, like ashes, and the horses’ hooves sank halfway to the fetlocks with each step; where the ground was overrun with deep seams and cracks that could easily turn a horse’s ankle or even break a leg; and where the whole confounded mess was interspersed with sagebrush and greasewood. Crossing twelve miles of this in pursuit of the buffalo, Hornaday wrote, was “killing work” and very slow. The ashy soil had one big advantage, though: tracking was easy. Finally, the animals left the gumbo ground and passed into grassy country near a small stream called Taylor Creek, where tracking was practically impossible. Around noon, the hunters rode up onto high ground and Hornaday surveyed the windswept, treeless countryside with binoculars. About two miles away, resting on the level summit of a small butte, he spotted the buffalo; the original drove of seven had been joined by seven more. Although it was a fragment of the once-mighty multitudes, nevertheless it was the biggest herd Hornaday had ever seen in the wild. The hunters crept up to within 200 yards of the animals and, on a signal, they all began to fire. The buffalo leaped to their feet, unharmed, and bounded away at breathtaking speed, heading for the shelter of the ravines. Hornaday and the cowboys leaped back in the saddle and took off at a mad gallop, this time directly through a vast prairie dog town, even worse than gumbo ground, which could have snapped a horse’s leg should it slip down into a hole at top speed. But none of the horses were injured, and once they’d caught up to the fleeing buffalo, Mc-Naney killed a fine old bull and a beautiful two-year-old or “spike” bull. Hornaday brought down a cow and another large old bull. It was a fine day of hunting, even shot through with the aftertaste of remorse as it was. For the rest of October, as the aspen leaves turned and then began to fall, the museum party focused their hunt on the heads of the ravines, the buffalo’s secret hideouts. By the end of the month, they had taken a total of twelve specimens, with Hornaday, by firelight, spending his evenings painstakingly preparing the skins and skeletons for museum mounting. He cut “SIBO” into the thin, cutaneous muscle that lined the inside of the buffalo hide, a brand which stood for “Smithsonian Institution Buffalo Outfit,” the official name of the expedition. It was just the way the old buffalo hunters used to mark their hides in the days of the great slaughter. Hunting these last remaining buffalo in this murderous country was doubly difficult because the few that remained alive had probably been shot at before and spooked at the slightest sound. In open country, they also could run like the wind, even though the big bulls could weigh almost a ton. McNaney’s technique, once he’d spooked a buffalo into a run, was to fool the buffalo into thinking he’d abandoned the chase, then spur his horse into making a wide circuit of three or four miles, cut in ahead of the buffalo and lie in wait for it behind the crest of a ridge. It took hard riding, but it could be done without killing the horse, and McNaney never seemed to fail. Russ, riding his favorite horse Selim, “an ungainly old beast with a gait like an elephant but staying powers like a steam engine,” sometimes used a more straightforward method, actually overtaking a solitary old bull who had a half-mile head start in a straight-ahead race. This hunt,Hornaday admitted in his journals,was “great sport,”partly because it was so difficult and partly because he enjoyed the rugged outdoor life and the friendly rivalry that developed among the hunters. ( Jim McNaney won the hunting contest because he was far and away the best shot, coupled with having the canniest intuition about buffalo behavior.) “In our eagerness to succeed in our task,the sad fact that we were hunting the last representatives of a mighty race was for the time being lost sight of,” he wrote. Buffalo were such indomitable animals, particularly the big bulls, that very seldom did they fall with the first shot. Even though they might be gravely wounded, they had to be chased, often for miles, before they were brought down with repeated volleys of gunfire, aiming for heart, lungs, or spine.11 One day McNaney and Russell shot four buffalo, including a big bull which finally fell eight miles south of where it was first hit. By then it was getting dark, so the cowboys left the bull and returned the next day to skin it out and skeletonize the carcass for later mounting. When they came back the next morning, however, Hornaday and the cowboys came upon a shocking scene: The bull had been stripped of its hide and flesh, its bloody skeleton exposed to the sky, its leg bones broken to get at the marrow, its tongue cut out. The great lionlike head, with its fearsome horns and immense, sorrowful face, was still intact. But one half of the head had been smeared with yellow paint, and the other half with red paint. A tattered bit of red flannel had been tied to one horn and fluttered fitfully in the breeze, apparently as a signal of defiance. Around the denuded carcass, Hornaday found moccasin prints in the sand. A small band of Indians, thought to be Piegans (members of the Blackfoot nation) were later reported to have been seen in the area a few days earlier. The Piegans, renowned for their skill and savagery as warriors and their prowess at stealing horses, were nomadic peoples who depended on the buffalo for their existence. The decimation of the great herds had brought disaster to these free-ranging people. Ethnographers believe that as many as one-fourth of the Piegans in Montana died of starvation during the years 1883 and 1884. They had laid claim to the fallen bull--very likely one of the last wild buffalo the tribes of the northern plains would ever see--because they believed that it belonged to them. It was not only the buffalo that was passing away. It was also the end of the ancient ways of the native peoples who revered and depended on them. [The bull] was still alive, and in a terrible rage. He stood up on his fore legs, pawed the ground, and tore around as far as he could. Tried hard to get up, but could not. His eyes fairly flashed fire. We stood at a safe distance awhile and studied him, then, as it was getting late, I drew up, aimed for his heart, and fired. The blood gushed out of the hole, and the old fellow gave a great shudder. He struggled mightily for a moment, then his head slowly sank until it touched the ground. Rising on his fore legs, he threw his head high into the air until his nose pointed at the sun, and his eyes rolled in agony toward the sky. He opened his mouth and the blood ran out. An instant later, he fell suddenly prone upon his side, and his left fore leg, by a strange coincidence, pointed straight at me and shook like a mighty arm in reproach and condemnation. Finally, after two months in the field, the Smithsonian party had reached a total of nineteen buffalo skins, one shy of their target of twenty. They decided to pack up and head back towards Miles City, hunting and camping along the way. By now it was late November; they’d already had one forty-eighthour Montana blizzard, which kept them huddled in their camp for two days, feeding firewood into the little Sibley camp stove, supplying oats to the storm-beaten horses and playing draw poker for gun-wads. Finally, the weather cleared, but the hunters decided it was about time to call it quits. They packed up the wagon and prepared to head south. But before they did, Hornaday told the cowpokes, he was going to let them pilot the wagon because he wanted to kill another big bull “before this thing is over.” On November 22, Harvey Brown noted uneasily in his diary that it had snowed all night and was five below zero at dawn; two degrees at one p.m.; and already four below at nine p.m. “The terrors of a Montana winter” were fast approaching. But the light snow made conditions perfect for tracking, so Hornaday and McNaney rode out away from the wagon train in search of game. They had crossed two or three snowy ridges, then began descending through steep country toward a dry river bottom, when Hornaday spotted the light-brown humps of three buffalo, about 200 yards away. The buffaloes appeared to be a youngster, perhaps two years old; an old cow; and an immense bull, the largest Hornaday had ever seen. He and McNaney jumped off their horses and ducked behind a clump of sagebrush, but the animals spotted them and took off through the snowy ravine at a slow trot, kicking up a spray of snow as they ran. Hornaday stood up, squared himself into a wide stance, and got off a couple of shots with his .44-40 Winchester buffalo rifle, but both bullets missed. McNaney had better luck, or better aim. Hornaday saw a cow go down, and watched as the other cow and the great bull hightailed it over the hill. He slammed a few more cartridges into his Winchester, leaped onto his Indian pony, Brownie, and took off at a gallop through the snowcovered sagebrush. Brownie was a splendid, high-spirited animal, and he mounted the hill and flew down the other side like the wind until he drew even with the fleeing pair of buffalo, who were tearing away down the ravine with wads of snow flying up from their hooves. The bull, seeming to sense that he’d been caught, stopped suddenly and whirled around to fight, his head lowered, shovel-shaped horns thrust outward like an invitation to death. Hornaday fired once for his lungs, but the shot was low. He fired a second time at his shoulder, and the beast went down, head foremost, in the snow. Without waiting to watch what happened next, Hornaday took off in pursuit of the cow, but she escaped. He reined Brownie back around sharply, and trotted back to the fallen bull. The bull was still alive and sitting up where he’d fallen. He seemed to me then, ay, and he did later on, the grandest quadruped I ever beheld, lions, tigers, and elephants not excepted. His huge bulk loomed up like a colossus, and the height of his great shaggy hump, and the steepness of its slope down to his loins, seemed positively incredible. . . . His massive head was crowned by a thick mass of blackish-brown hair lying in a tumble of great curly tufts, sixteen inches long, piled upon on each other, crowding back upon his horns, almost hiding them, and quite onto his shoulders. . . . The upper half of each foreleg was lost in a huge bunch of long, coarse black hair, in which scores of cockleburs had caught and hopelessly tangled. The body itself and the loin quarters were covered with a surprisingly thick coat of long, fine, mouse-colored hair, without the slightest flaw or blemish. From head to heel, the animal seemed to possess everything the finest buffalo in the world should have, and although by that time no stranger to his kind, I sat gazing upon him so completely absorbed by wonder and admiration that had he made a sudden charge he might easily have bowled me over. The immense bull stood there in the snow with his feet braced apart, head lowered, eyeing the hunter fiercely, with the whites of his eyeballs showing. His head sank very low a couple of times, then he abruptly lifted it and glared at Hornaday, panting. He pawed the wet snow with his wounded foreleg. He was a formidable adversary, a truly noble combatant, and he was not prepared to surrender. “With the greatest reluctance I ever felt about taking the life of an animal,” Hornaday wrote later,”I shot the great beast through the lungs, and he fell down and died.”15 When he and McNaney laid the big bull out in the snow and took measurements, he turned out to be five feet eight inches in vertical height at the shoulder; nine feet two inches end to end, from the tip of his nose to the back of the thigh; eight feet four inches in girth around the chest; and according to Hornaday’s reckoning, must have weighed about 1,600 pounds. When he dressed the animal out, he turned out to have four old bullets buried in his body; more than one hunter had aimed to have him as a trophy but failed. The horns of bulls taken in their prime were smooth and glossy-black, almost as if they’d been rubbed with oil, but this was what the old buffalo hunters called a “stub-horn.”That meant that this was an old bull whose horns had begun to peel off in layers at the base, leaving a thick, blunt stub, with only the tip of what was once a glossy horn showing through at the end. Because bison add a ring each year around the base of the horn, just as domestic cattle do, Hornaday judged that the bull was about eleven or twelve years old (in an animal whose natural lifespan was roughly twenty-five years). His tongue and lips were bluish-purple; his hooves were jet black; and his eyes, with a pear-shaped iris, were reddish brown. Hornaday lovingly noted all these details as he prepared the skin for mounting. Later, this superb animal would become the principal figure in Hornaday’s famous bison group that was displayed for sixty years at the Smithsonian. Later still, the bull became even more famous when he was used by the Treasury Department as the model for the bison depicted on the ten-dollar bill that went into production in 1901. Greengrocers, housewives, gamblers, shopkeepers, and petty criminals all made contact, however fleetingly, with the great bull who went down in the Montana snow that long-ago afternoon. The mighty bull, though fallen, served Hornaday’s larger purpose of bringing “wildlife to the millions” and so played his role in halting the extermination of his species. I may not see a hundred Before I see the Styx, But, coal or ember, I’ll remember Eighteen eighty-six The stiff heaps in the coulees The dead eyes in the camp And the wind about, blowing fortunes out, Like a woman blows out a lamp. The Smithsonian Expedition broke camp on December 15, during a brief thaw in the weather, packing the wagons with boxes of specimens, food, and camp supplies, saddling up the horses and ponies and heading back home. Hornaday knew that if the museum party did not get out of camp very soon, they could be in serious trouble. It was bitterly cold; they were running out of food for both men and horses; the snow made the Sunday Creek Trail almost impassable; and the Yellowstone River would soon be so choked with treacherous running ice that the ferry to Miles City would be closed for the season. Despite the hunt’s lingering sorrow, it had been hugely successful, producing twenty-two fresh buffalo skins, forty-four skulls, eleven skeletons, and various other skins and bones collected along the way. Hornaday reported to Secretary Baird that it was “the finest and most complete series of buffalo skins ever collected by a museum.” The buffalo, of all ages and sexes, would be an extremely valuable addition to the Smithsonian collection, with enough left over to distribute to other museums. Even so, Hornaday’s grim prediction, in 1889, that all the wild buffalo would be gone within ten years proved prophetic. In the winter of 1893-94, poachers killed 114 of the last band of wild buffalo cowering in the newly created Yellowstone National Park. And in 1897, the last four free-roaming buffalo were found in a high mountain valley in Colorado and shot. The hunters must have been exultant. They had succeeded in killing off the very last wild buffalo on the planet. It was only because there were a few animals still sheltered in private reserves or zoos, which would later be used to seed new herds, that the buffalo survived at all.